Over steaks too holy to be named, a couple of CA heavyweights were tasted: Beringer Cabernet Private Reserve 1986 and Pax Syrah Griffin’s Lair 2002, in that order. Beringer holds a strange place in the greater wine consuming consciousness. The name holds a certain generic- insert basic CA wine here- sort of connotation, largely due to the ubiquity of their many low-cost offerings. But this doesn’t change the fact that Beringer’s finest wines, their Private Reserve Cabernet and Chardonnay, are consistently high quality classic Napa wines, and have been for a very long time. In fact, Beringer’s ’94 and ’95 Private Reserve Cabernets are amongst the finest American Cabs ever to pass my lips, per dollar spent. It’s been raining, here in Brooklyn, and like any good City Kid, deep in the weeds of melancholy, I’m listening to a playlist of Sad Cowboy Music. There’s something about a guy pouring his heart out over an acoustic guitar, particularly if the voice sounds like that of a man who may very well have once shot a man in Reno, just to watch him die. There’s a fine line between despair and destruction, where the best of country music meets alcohol and pills. Just ask Hank Williams or Johnny Cash or Townes Van Zandt, the latter of whom just popped up on the shuffle singing “Don’t Let the Sunshine Fool You” with the glorious honesty of his tinny drawl. But the rainy day blues award has to go to Willie Nelson for “Opportunity to Cry” from Crazy: The Demo Sessions, which is a series of low-fi recordings from Willie’s very earliest days in the music industry, when he planned to make his way in the world writing songs for others to perform. Honorable mention: Gary Louris’ “She Only Calls Me on Sundays” from his heartbreaking Acoustic Vagabonds album. 1986 Napa Cab has long been one of my favorite places and times for wine, on the all-time, everywhere scale. I very much enjoy the longer lived and far more brooding Cabs of 1987 and often lament how few of the quite beautiful, but much softer, Cabs of ’85 have successfully made it with us, here to the future. But there’s a certain balance to the ’86s that make them stand out amongst that decades production, all these years later. This ’86 Beringer Private Reserve Cab is deep garnet in the glass, showing a touch of yellowing at the rim. The red and black fruit that is present is well integrated and is somewhat buried beneath ash, underbrush, and asphalt with notes of dusty cigar box and raw coffee bean. The palate carries greater weight and complexity than was expected, based on past performance. This wine has aged very strangely and is a stark example of “shutting down in the bottle”, which refers to a wine going thin for a period, on its way to full maturity rather than growing lithe on its way to oblivion, or vinegar. 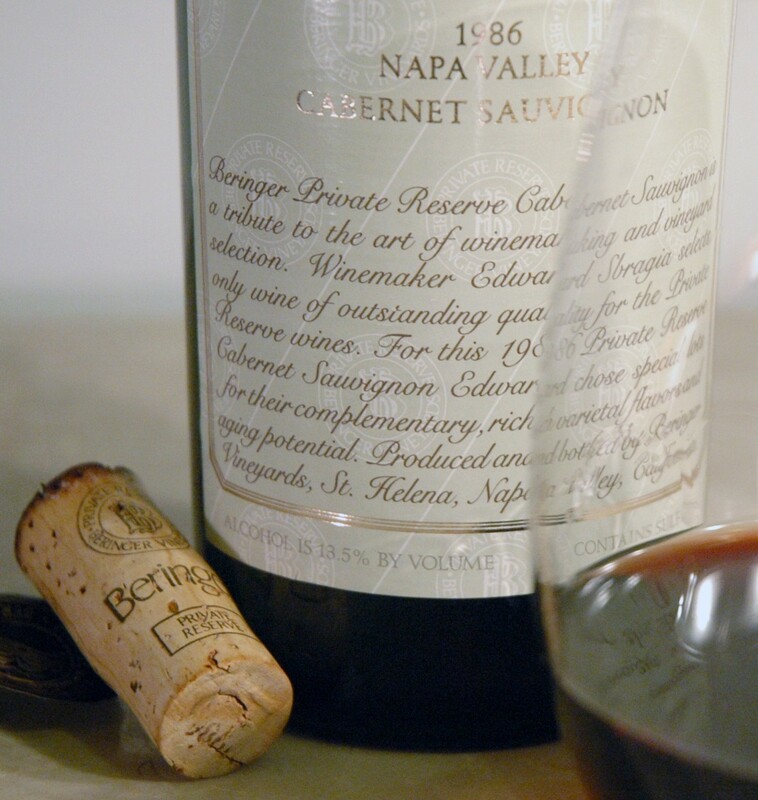 The 1986 Beringer Cabernet Private Reserve showed thinner, by a wide margin, 5 or six years ago than it does today. It is currently much bigger and fresher than inticipated, with a nice mid-palate dryness. After 2+ hours of breathing time the nose develops a light, warm Bordelaise funk. Beringer Cabernet Private Reserve 1986 is a 25 year old Cab with structure and acidity to spare, and after rebounding from its lean years in the cellar, it somehow shows signs of not yet quite having escaped the barrel in which it was aged. This is a profound and unusual wine in a lineage of stalwart Napa classics. The remaining bottles will stay sealed for at least another couple of years. All bottle variation aside, this wine may very well truly achieve peak drinking at a cool 30 years. Let’s perhaps discuss this again in 2016. If you have the means, I highly recommend picking some up. Bottle shown here is 2008. T-Vine Zinfandel Napa 1999 was the next in the ever darkening wine lineup. This one is fairly big and is ideally suited for the rich [Bedford] cheese [Shop] plate, also standing its ground against the accompanying cured and thinly sliced meats. First, a vintage note: 1999 is an underrated vintage for much of CA (as well as for Bordeaux). So many different varieties of wines originating from Santa Barbara to Bolinas are fairing far better than their ’98 and ’00 counterparts and represent a significant value over the much hyped (and excellent) ’97 and ‘01/’02 vintages flanking them. As for Bordeaux, 1999 represents the last solid vintage to still occasionally be available at a significant price break from every vintage that has come since (minus the much maligned 2002), and they are aging beautifully. Up on the itunes, the shuffle finds our ears flooded with the twangy strings and lush harmonies of Jeff Austin (Yonder Mountain String Band) & Chris Castino‘s (The Big Wu) Songs From the Tin Shed (2004), from the pre-master recording. The music ranges from Sad Cowboy to Hillbilly, the tone from wistful to joyous, and includes a small handful of well placed covers amongst the majority original tunes by Austin and Castino. While Songs From the Tin Shed is far less known than the records (and live shows) of Yonder Mountain String Band or The Big Wu, the quality of its execution and heights of its sincerity will continue find its way to and delight ears- with a propensity toward twang- for generations. T-Vine Napa Zinfandel 1999 is toward the shallow end of full bodied in color with a broad mouthfeel and long lingering acidity. There’s a piney sweetness and something ruggedly floral, like the unlikely offspring of a honeysuckle and some mutant wild thistle. This wine both grows in depth and softens in mouthfeel as another hour of air expands its horizons. T-Vine continues to quietly make very serious small batch wine in a number of varietals, both blends and single vineyards, including the recent addition of a Grenache from the incomparable Paras Vineyard. If you have not already, T-Vines is highly worth looking (and tasting!) into.